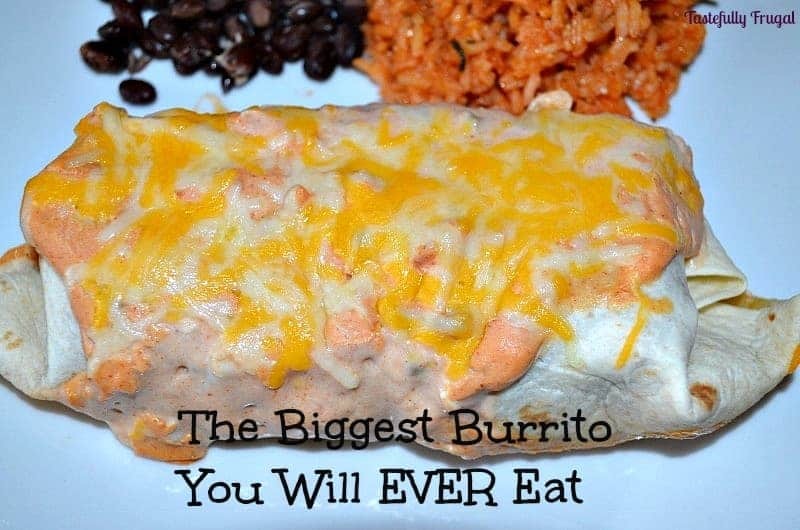 The Biggest Burrito You Will EVER Eat! Ever had one of those days where you get so busy you forget to eat? You’re running errands, cleaning the kitchen, doing your fourteenth load of laundry, changing diapers, getting sippy cups of milk and treats, taking kids to the park, kissing boo boos better, making the kids lunch, laying the kids down for naps. And then finally when you get a second to yourself to check your email or Facebook your stomach starts yelling at you… No, it’s not a tiny grumble; it’s a full on two-year old temper tantrum “FEED ME!” If you can’t tell this happens to me on a semi regular basis. 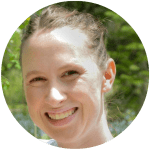 I know, I know it is super bad to not eat all day, and I do usually have a bowl of cereal and a banana before the boys get up, but most days I get so involved in what my boys and I are doing that eating gets pushed, well shoved really, down to the bottom of the list. Add taco seasoning and water and let simmer for 5 minutes. While taco meat is simmering, in a bowl mix together sour cream, taco sauce and cream of mushroom soup. Spread about 1/3 of the sour cream mixture into the bottom of a 9×13 casserole dish. 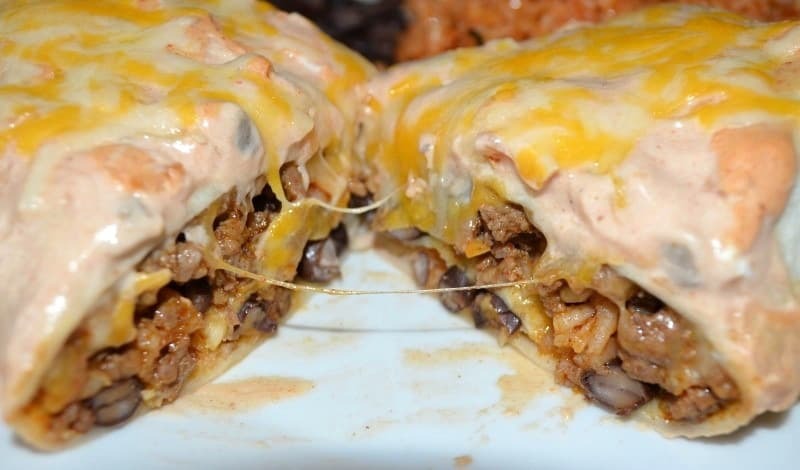 Prepare the burritos by layering 2-3 spoonfuls of taco meat onto the tortilla, sprinkle with cheese then add 2-3 tbsp of Mexican rice and 2-3 tbsp black beans. Spoon over 1 tbsp of sour cream mix then roll burrito. 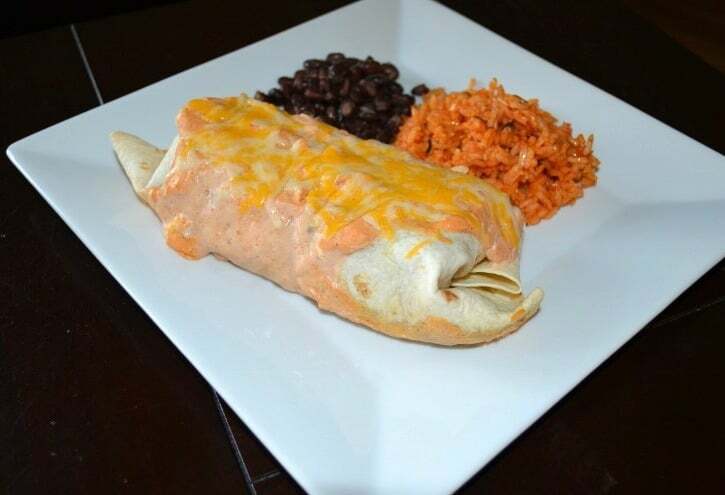 Cover burritos with remaining sour cream mix and cover with the rest of the cheese. Serve with remaining Mexican rice and black beans. These burritos are super filling so if you aren’t really hungry or have young kids this can easily be 6-8 servings. My husband, two boys (they are only 2yo and 14 mo) and my hungry self ate three of the four burritos and the fourth burrito was lunch for me for 2 days! You could also make these ahead of time and freeze them. All you’d have to skip is putting the sour cream mix in the burrito and on top. 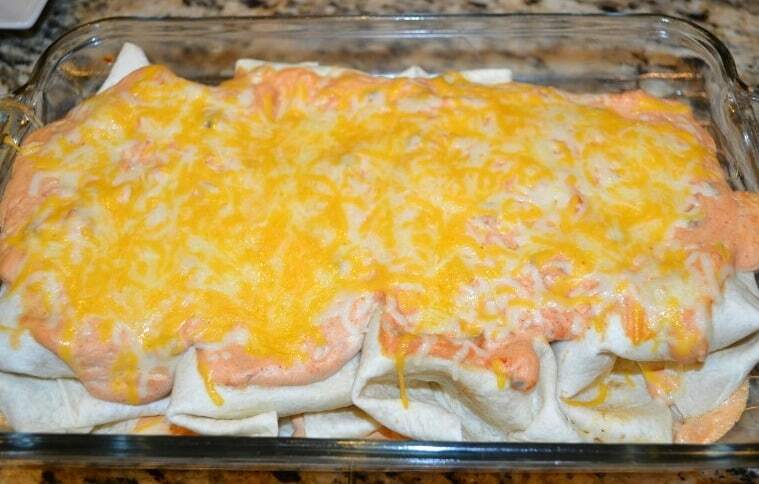 Top with sour cream mix and cheese just before putting in the oven. This sounds super tasty! YUMMY!